Disney’s new adaptation of Madeline L’Engle’s 1962 children’s novel of the same name, which has been guided to the screen by acclaimed director Ava DuVernay, A Wrinkle in Time is a contemporary take on the classic story that also stays mostly faithful to the source material. The result an ambitious and brightly coloured mix of sci-fi and fantasy, and I enjoyed being taken on the sometimes emotional and sometimes downright trippy ride that it offers. Sure, the film has some faults, which I’ll get to later on, but this is also a movie that’s primarily made for families, and a pretty good one at that. The story follows Meg Murry (Storm Reid), an adolescent girl who is an outsider at school. Her mother (Gugu Mbatha-Raw) and father (Chris Pine) are both physicists, and her father has been missing for four years, after disappearing while investigating a way to travel instantly through space by tapping into different frequencies using something called a Tesseract. Joined by three mysterious supernatural beings – Mrs. Whatsit (Reese Witherspoon), Mrs. Who (Mindy Kaling) and Mrs. Which (Oprah Winfrey) – Meg is taken on an interplanetary journey with her prodigious little brother Charles Wallace (Deric McCabe) and a boy from school named Calvin (Levi Miller), to rescue Dr. Murry and stop a dark force known simply as the IT that is sucking up the light in the universe and replacing it with darkness. Partially because of the iconic stature of the source material, A Wrinkle in Time has been generating mixed reactions, and I do somewhat understand why. The $100 million budget is splashed across the screen, and the film does have many wondrous visual flourishes, but some of the special effects are also kind of cheesy, including Mrs. Whatsit’s winged creature form and a giant-sized Oprah that looms in the background. The film also has a bit of an over-relience on pop songs, and the narrative structure relies heavily on being built around set-pieces, which can make it feel a little episodic. The film does make some changes to the book, most notably removing the sequence with Aunt Beast, taking out the characters of Meg’s twin brothers, and changing the gender of the Happy Medium, who is played here by Zach Galifinakis as a somewhat campy character who provides both guidance and comic relief. Mrs. Whatsit is also depicted as looking much younger than the weathered old lady she was described as in the book, and the “haunted house” where the Mrs. W’s live is no longer in the woods, but now in the inner-city. But for the most part, Ava DuVernay has crafted a faithful adaptation, and the majority of these changes do work to streamline the material for a smoother transition to film. The screenplay, which was co-written by Jeff Stockwell and Frozen director Jennifer Lee, who is herself a huge fan of the book, captures the essence of Madeline L’Engle’s work. The book was groundbreaking for 1962, and got rejected over two dozen times before finally being published. It has frequently ended up on lists of the most challenged and banned books over the years, due to its melding of science fiction and religious themes. While the movie doesn’t feel as radical now as the book did at the time, I think this is mostly due to changing attitudes over the years. At its best, like in the climactic sequences when the characters are tested on a nightmarish planet, this adaptation of A Wrinkle in Time can be quite stirring and also emotionally engaging. A big part of why the film works is because of the strength of the young actors who were cast in the leading roles. Reese Witherspoon, Mindy Kaling and Oprah Winfrey might be the big names here, and they all do likeable work, but it’s the trio of younger performers who carry much of the movie on their shoulders. Storm Reid is quite good at portraying both Meg’s vulnerability and quiet strength, and Deric McCabe delivers impressive work for a child actor, handling the demands of his character very well. The story touches on bullying and body image issues, which are important and timely themes, especially for a film that is geared towards middle school audiences. The film does a good job of showing Meg’s struggles with self-esteem, including feeling self-conscious about her curly hair, which was present in the book as well but takes on added resonance here as her character in the movie is mixed race. The main crux of Meg’s journey is that she must learn to accept herself in order to harness her true potential, and this journey towards self-fulfillment provides the main heart of the film. The story is also about fighting against conformity, best visualized in a creepy sequence where the characters are tested on a suburban cul-de-sac with kids all dribbling basketballs in unison. The story’s most universal theme is that we have to fight against the darkness in order to find the light, with the light manifesting itself as love and kindness and the dark representing hatred and jealousy, and this is a message that we can all get something out of. Yes, it’s a little sentimental at times, but I enjoyed A Wrinkle in Time because it does wholeheartedly embrace this sense of positivity. This is a completely and refreshingly uncynical film that has its heart in the right place, and I liked the hopeful and inspiring message behind it. Based on the classic 1962 novel by Madeline L’Engle, this newest big screen adaptation of A Wrinkle in Time is a solid adventure film for the middle-school aged crowd. In A Wrinkle in Time, we follow young Meg Murray (Storm Reid), who’s father Dr. Murray (Chris Pine) has been missing for the past four years. Her parents are both scientists with a specialty in theoretical physics and at the time of his disappearance, her father had just announced his work in the field of interstellar travel through the ability to wrinkle space-time. Ridiculed by the academic community for this announcement, most people around Meg presume her father disappeared intentionally in one way or another, although she still holds onto a last shred of hope that he will be coming back one day. Before her father disappeared we learn that Meg was a bright, top student, but the longer her father has been gone the more her light disappears as she has become depressed, withdrawn, and getting called into the principal’s office. The one other person who truly believes their father will be coming back one day is her younger adoptive brother Charle Wallace (Deric McCabe), who is convinced of the reality of space–time travel. When Charles Wallace introduces Meg and her friend Calvin (Levi Miller) to three interstellar beings, Mrs. Which (Oprah Winfrey), Mrs. Who (Mindy Kaling), and Mrs. Whatsit (Reese Witherspoon), who have heard a call from across the universe they say belongs to Dr. Murray, Meg, Charles Wallace, and Calvin are transported across the universe in search of him, and to face a dark energy that spreads negativity and preys on the fears in the universe, named only ‘The It’. The film works solidly as an adventure, especially for the 8-14 crowd, and moves along at a good pace without feeling rushed. But what really makes the film work as well as it does, is the acting from its young leads. All three kids do a stupendous job bringing their characters to life, in particular young McCabe as Charles Wallace, delivering the many sides to his character and ample dialogue with an intelligence and confidence without being annoying, and Reid as the lead Meg. Reid expresses the emotional depths of her character with such quiet subtlety that completely avoids the trap of overacting that some actors of her age-range fall into. It is this believability and vulnerability that added layers to the way we follow these characters and engage with the journey they are on. Likewise, the adult actors all played their roles quite well, perfectly embodying the roles – solid casting all around. In terms of the special effects, they are nothing ground-breaking, however they service the story well enough and didn’t draw me out of it, even when they were slightly dated looking at times. 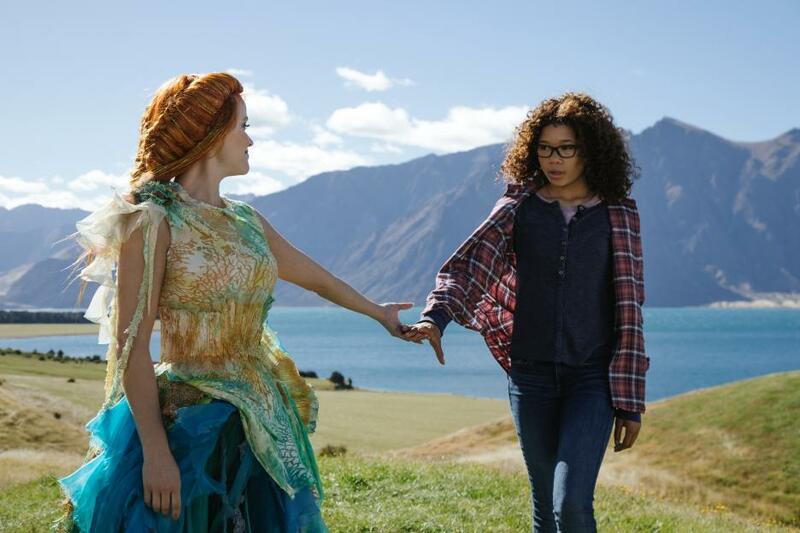 Overall, while it is not going to be one of the top films of the year, as a March Break release, A Wrinkle in Time is going to provide an entertaining time at the movies, with characters that kids can relate and connect to. A well-directed and acted film with a good storyline, I have no qualms recommending seeing A Wrinkle in Time. Kids are going to enjoy this one, and adults won’t really mind sitting through it either. Personally, I quite enjoyed it. 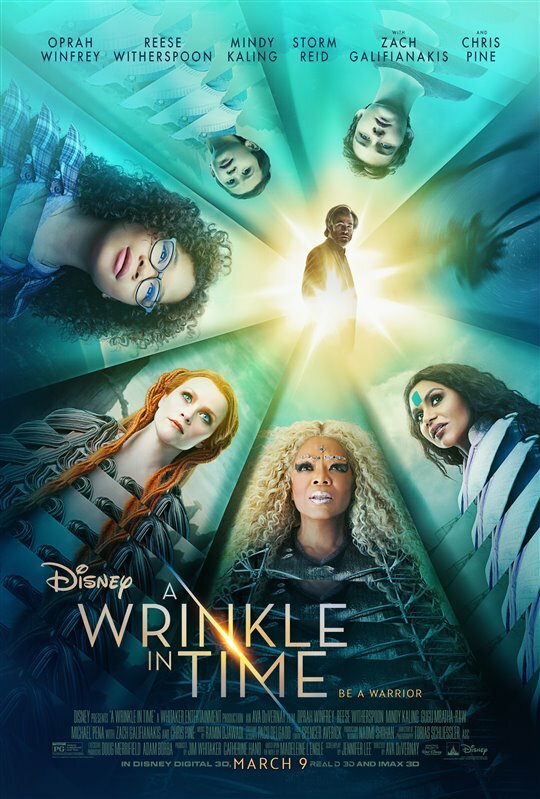 A Wrinkle in Time, directed by Ava DuVernay, is the latest princess-free Disney film based on the 1962 children’s classic novel by American author Madeleine L’Engle. The Murry’s (Chris Pine & Gugu Mbatha-Raw) are a mixed-race couple (an update from the book) of brilliant physicists whose tesseract theory of wrinkle (not warp) travel (called “tessering”) gets them laughed out of a conference of fellow scientists. They have two kids: Meg (Storm Reid) and Charles Wallace (Deric McCabe). We first see a younger Meg in a flashback fascinated by her father’s Chladni figures (cool geometric interference patterns made by sand on a vibrating plate). He soon realized that this could be the key to tessering, if he could just find his own resonant frequency, and he has been lost ever since. Four years later, Meg is in middle school, a brilliant nerd with glasses bitter about her father’s alleged abandonment–an obvious target for the mean girls. Charles Wallace, who at six years of age doesn’t remember his father, feels just as alienated as Meg, but his intelligence is off the charts. Three mysterious women with big hair and overdressed for anywhere on Earth appear to Meg, CW and Calvin (Levi Miller), a cute boy from school who likes Meg more than she likes herself. As Celestial Warriors of light, Mrs. Whatsit (Reese Witherspoon), Mrs. Who (Mindy Kaling) and Mrs. Which (Oprah Winfrey) offer to help Meg find her father, and they are all tessered to a distant planet. Filmed in New Zealand, this beautiful place has fields of chattering levitated orchids and the kids are taken around on the back of Mrs. Whatsit morphed into a flying vegetable. Seeing a black cloud, they are told that this is the “darkness” that is taking over the universe with all that is evil, embodied in a creature known as the “It”. They then go to another planet where a seer known as “The Happy Medium” (Zack Galifianakis) shows Meg her father’s possible location, a planet too dark (like a black hole) for the Warriors since once there they might not escape. They tell Meg to “be the warrior”, trust no one, and embrace her faults. Without trying to spoil too much, I’ll just say that Meg will rescue Dad, but not before at least one of her companions goes, as it were, to the dark side and she is zapped and tangled up by giant neurons within It’s brain. Unaware of the original source and having grown up avoiding the physical and chemical vices of the 1960s, indeed ending up teaching some of the physics mentioned here, my first (vicarious) impression of A Wrinkle in Time was “What a [psychedelic] trip”. Moreover, I couldn’t avoid comparisons with Star Trek and Star Wars. When Mrs. Which said the tag line “Be a Warrior” and Meg replied “I’ll try” I almost croaked out loud “Try not!” But when I got home and looked it up I realized that the book had predated the other two series. 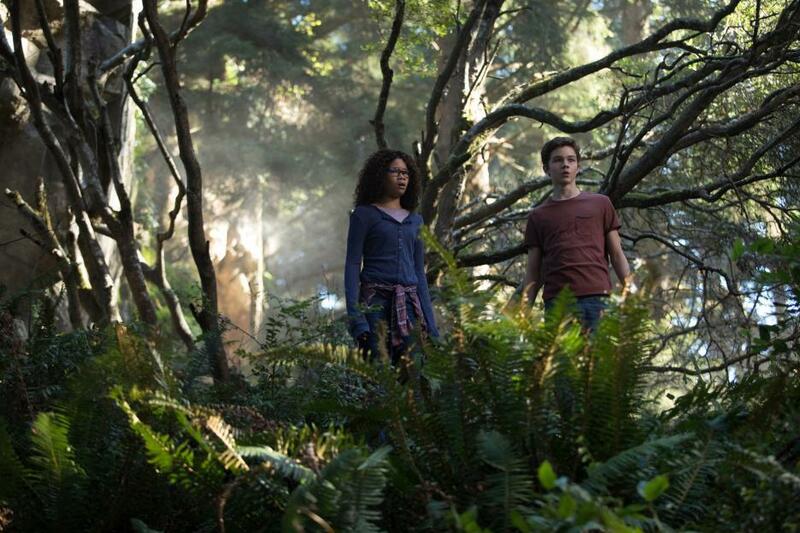 I still believe A Wrinkle in Time may not be as popular as the Star Wars/Trek series for anyone beyond adolescence unfamiliar with the book; but with excellent production and a fine diverse cast led by the brilliant Storm Reid, it will really appeal to its target audience and should be a great inspiration to kids, reminding them that they are all beautiful in their own ways.